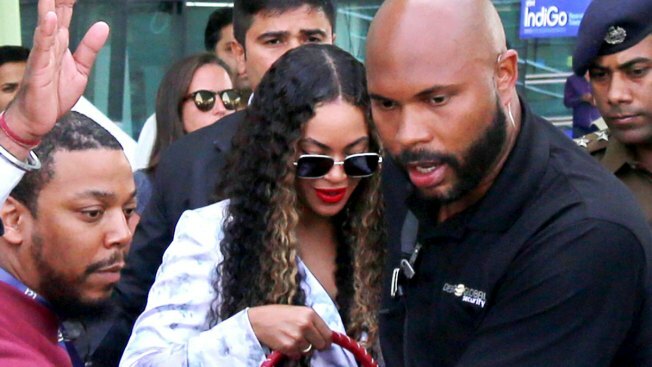 In this Sunday, Dec.9, 2018 photo, singer Beyonce arrives at the Udaipur airport in Rajasthan, India. According to local reports Beyonce was in India to perform at a pre-wedding celebration of for Isha Ambani and Anand Piramal. Beyonce brought her star power to a pre-wedding party for the daughter of India's richest mogul. The 37-year-old singer performed Sunday and sang some of her hits such as "Crazy In Love" and "Perfect." Guests included Hillary Clinton and a host of Bollywood stars in the historic Indian city of Udaipur. Beyonce posted a photo on Instagram of one of her outfits and a video giving a sneak peak of her performance. Mukesh Ambani's daughter, Isha, is marrying Anand Piramal on Wednesday.